Below I’ve tried to briefly describe the origin of my the background. I considered myself to be an open-minded individual whos enjoys learning about people from different walks of life (countries, languages, religions, philosophies,etc) so please feel free to enlighten me, leave a comment if you have anything to say or add. The name derives from the word “Punjab,” which is a combination of the Persian words ‘panj’ (پنج) meaning Five, and ‘āb’ (آب) meaning Water, giving the literal meaning the Land of Five Rivers. Punjab is a state in India known as the “The Granary of India” or “The Bread Basket of India.” It is one of the most fertile regions on earth. It has been inhabited by different religious and ethnic groups, including Sikhs, Jains, Buddhists, Greeks, Persians, Arabs, Turks, Mughals, Afghans, Balochis, Hindus and British. It is known as the birth place of Guru Nanak; Sikhism, Buddhism and a place where the oldest and holiest Hindu texts such as the Vedas, Upanishads and Mahabharata were composed. 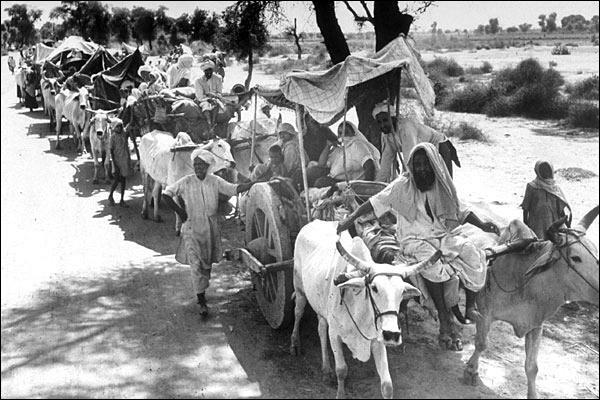 The Sikh state of Punjab was the last state to fall under British rule and in 1947 when that rule did finally come to an end when the British partitioned India. 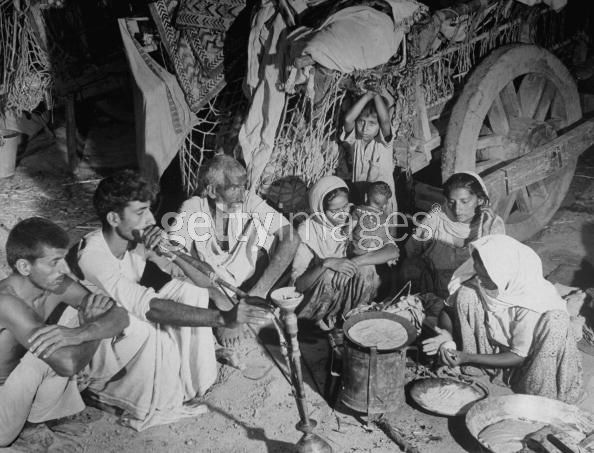 Punjab suffered greatly as 13 of 15 million people were punjabi. 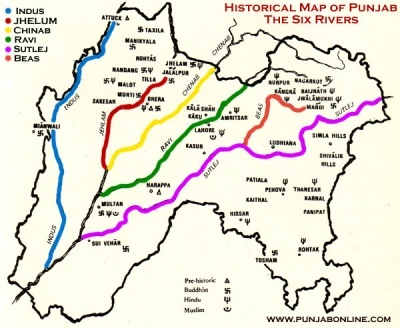 4 of the 5 rivers of Punjab went to Pakistan (old Punjab) and the remaining river was allotted to India (current Punjab). 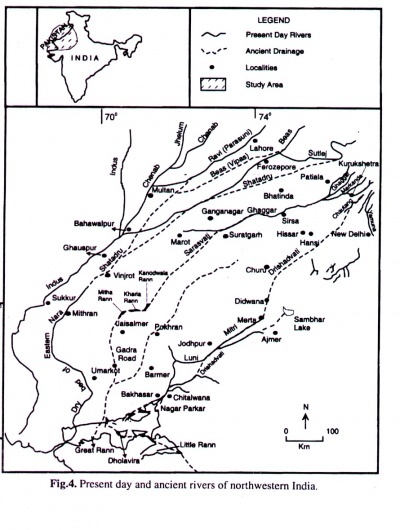 Below is a section where an image shows how large Punjab was and what Punjab once was. These five rivers that run through Punjab, having their originating source as various small lakes in Himalayas. If one were to go across the Punjab starting from Delhi and to Afghanistan, the rivers are in this order. Beas, Satluj, Ravi, Chenab & Jhelum. Today Punjab faces many social, environemntal and political issues around issues such as agriculture, water, poverty, education, religion along with particular aspects of globalization. . There are other major injustice and violations against civil rights which you’ll get a quick glimpse a little further down. Sikhs had been persecuted by Muslims at points in history to convert and also by Hindhus which isthe perdominate religion in India. You’ll get a brief glimpse below into “Worlds Largest Democracy” from the unbiased perspective of nobel piece prize winner, economist, heads of states and foriegn aid agencey such as Amesty International. Punjabi civilization is one of the oldest on earth, with its distinguished language, culture, food, attire, script, folklore, people, etc. When people think of Indian food, its actually Punjabi food, and when they think of that upbeat Indian music, its actually Punjabi Music or what we call Bhangrah. In 450 B.C (2450 years ago) Alexander the Great invaded Punjab and conquered a great Punjabi king named Porus whose kingdom was on the banks of the river Chenab. When King Poros was taken before Alexander. 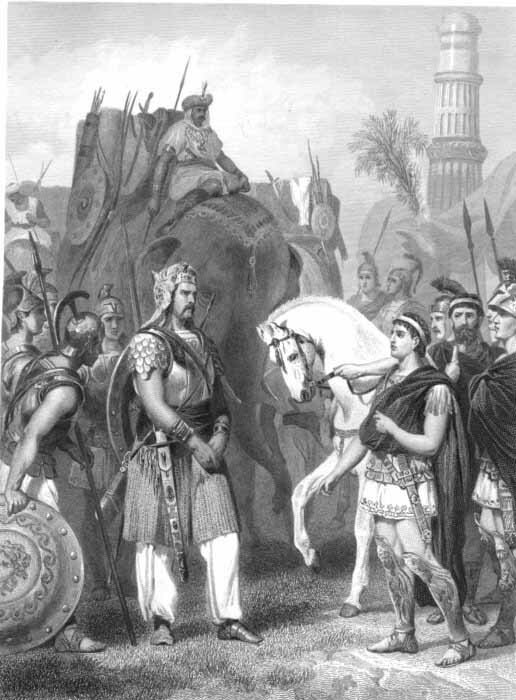 Alexander the Great asked King Porus how he thought a captured King should be dealt with? Porus answered that he should be shown the respect owed to a King. He was restored back to his throne by Alexander. Alexander returned to Iran before crossing the river Beas, as his forces, now so far from their homelands, refused to go any further. In his train we have a reliable resource that tells us about Punjab 2450 years ago. Not much different from today (except for the technology). Punjab was the last state conqured by the British, it happened after Mahraj Ranjit Singh died in 1839 that the Sikh state crumbled, damaged by internal battles for the leadership. The Sikh Maharaja Ranjit Singh after several campaigns he united the Sikh factions into one state and he took the title of Maharaja on April 12, 1801 (to coincide with Baisakhi day), with Lahore having served as his capital from 1799. In 1802 he took the holy city of Amritsar. He then spent the following years fighting the Afghans, driving them out of western Punjab. He also captured Pasthun territory including Peshawar. This was the first time ever that Pastuns were ruled by non-muslims. This event has a very important historical perspective. 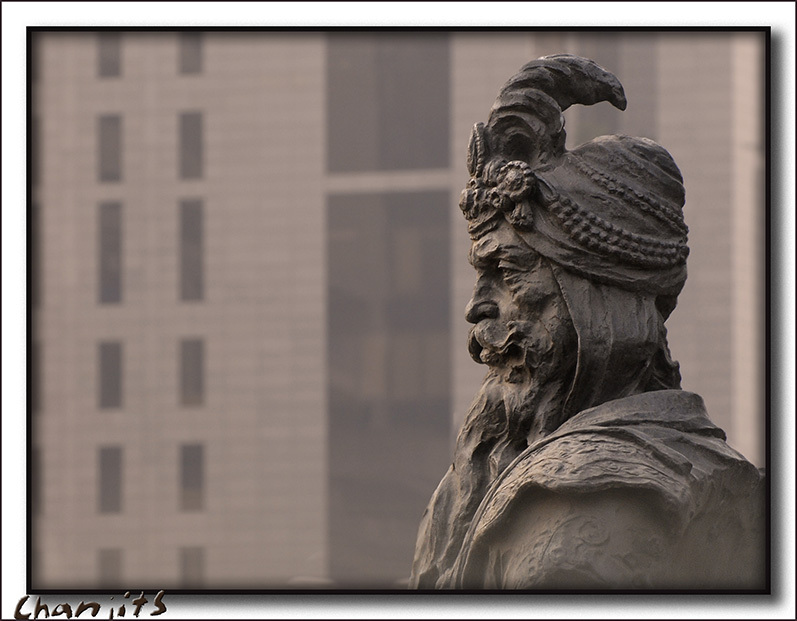 For more than a thousand years invaders had come down from the Khyber pass and ruled eastern lands. Ranjit Singh reversed this trend. When the Sikh empire finally fell to the English, they were able to retain this province. He captured the province of Multan which encompassed the southern parts of Punjab, Peshawar (1818), Jammu and Kashmir (1819) and the hill states north of Anandpur, largest of which was Kangra. He also modernised his army, hiring European mercenaries to create the first modern Indian Army, the effect was to create a powerful and heavily armed state and at this point Punjab was the only state not controlled by the British. He brought law and order, yet was reluctant to use the death penalty. He stopped Indian secular style practices by treating Hindus and Muslims equally. He banned the secular “jizya” tax on Hindus and Sikhs. In his multi-ethnic empire he was famous for its tolerance with Muslims and Hindus holding high states of office. The Empire was effectively non-secular as it did not discriminate against Hindus and Sikhs , relatively modern and had great respect for all religions of the Empire. This was in sharp contrast with the ethnic & religious cleansing of past Moghul rulers. Ranjit Singh had created a state based upon sikh and hindu noble traditions, where everyone worked together, regardless of background. Where citizens where made to look at the things that they shared in common, e.g. being Punjabi, rather than any religious differences. The British at this time, on the subcontinent, where expanding and consolidating their grip on power. Whereas, in Punjab they had met a comprehensive road block for complete supremacy, on the subcontinent. Ranjit Singh had stopped the ever expansion of the British Empire, during this time- around Punjab, and this could have been permanently entrenched by competent political heirs. Ranjit Singh died in 1839 and the state went to his eldest son Kharak Singh. The Kingdom, that he had worked so hard to build, began to crumble due to poor governance and political mismanagement by his heirs. His successors died through accidents and murder, while the nobility and army struggled for power till the end of the Second Anglo Sikh War, when it was annexed by the British from his youngest son Duleep Singh. However, after the First Anglo Sikh War, Punjab effectively ceased to be an independent state and all major decisions where made by the British Empire. The Punjabi Army had been reduced under the peace treaty, with the British Empire, to a tiny skeleton force. Moreover, massive punishing war compensation had destroyed any meaningful, independent fiscal policy. Most historian believe competent political heirs would have forged a highly durable, independent and powerful state (Ranjit Singh had done during his rule). Ranjit is remembered for uniting the Punjab as a strong state and his possesion of the Koh-i-noor diamond. His most lasting legacy was the beautification of the Harmandir Sahib, holiest site of the Sikhs, with marble and gold from which the popular name of the “Golden Temple” is derived. The Sikh State of Punjab was the last state to fall under British rule, it was ten years after Maharaja Ranjit Singh’s death that the empire he helped unit broke. Many valuable articates were robbed by the British at this time and now artificats of Mahraj Ranjit Singh along side artifcate of Guru Gobin Singh, the 10th living guru of the Sikhs can now be found at The Louvre Museum in France. The word Guru means teacher. This was a shameful event in the history of British India. In April 1919 British troops commanded by General E H Dyer opened fire without warning on 10,000 people who were holding a protest meeting. The troops killed about 400 people and wounded 1,000. 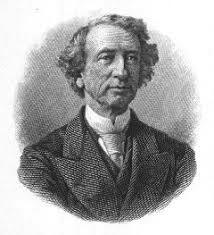 Dyer felt that he had been obliged to teach a moral lesson to the Punjab. Realising the damage that had been done, the British rapidly retired Dyer, but not without promoting him first. 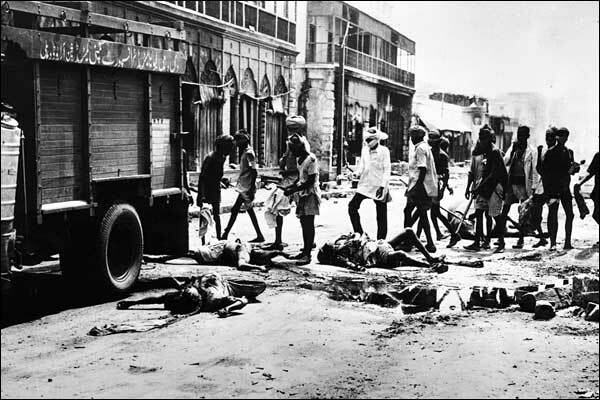 Some historians regard the Amritsar Massacre as the event that began the decline of the British Raj, by adding enormous strength to the movement for Indian independence. In October 1997, Queen Elizabeth II made the gesture of laying a wreath at the site of the massacre. 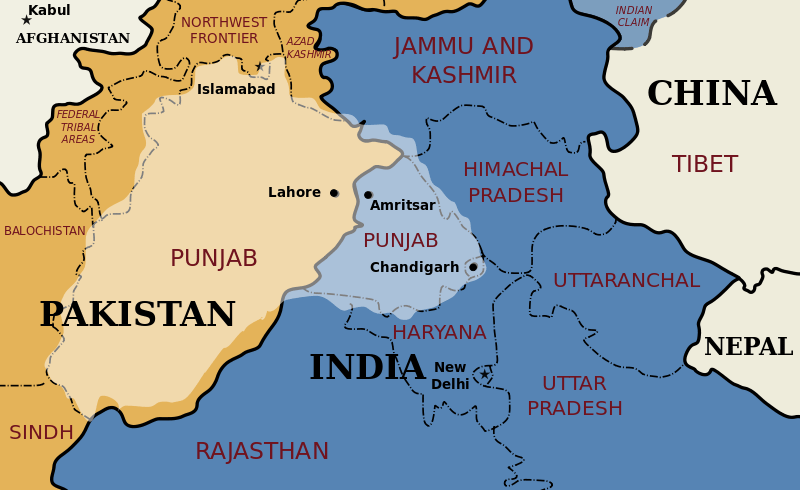 Since 1947, when the historic Punjab was divided in two parts with a portion in Indian and another in Pakistani both halves still share the name Panjab. As the former capital of Lahore became part of Pakistan a new Capital city called Chandigarh was planned and built on the Indian side of the border. It now serves as the capital of both Punjab and Haryana. Considered one of the most beautiful planned cities in the world with its manmade lake, it has the highest standard of living and the highest per capita income in India. 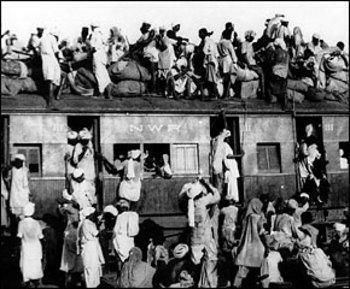 The Partition of India in 1947. This was my Grandfathers time… History is an interesting thing, because you always have to remember who wrote it. The Sikh ambition for a state of their own was something that India would not concede. To do so would have allowed communalism (i.e. religious groupings) an unbreakable foothold in the politics of what was supposed to be a secular state. However, in 1966, after years of Sikh demands, India divided the Punjab into three, recreating Punjab as a state with a Sikh majority. This was not enough to stop Sikh anger at what they saw as continuing oppression and the unfair way in which they thought India had set the boundaries of the new state. 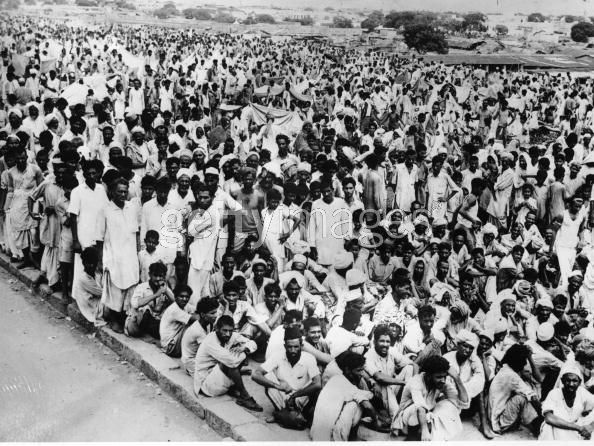 They continued to demand various concessions from the Indian government. As Sikh discontent grew, the conflict gradually changed from a purely political conflict into a confrontation between Hindus and Sikhs; and then to real violence. A Sikh preacher called Jarnail Singh Bhindranwale became the leader and in 1983 Bhindranwale and took refuge in the Golden Temple Complex at Amritsar, the most revered place in the Sikh world. The Indian government believed that the Temple was being used as a militant command post, a sanctuary for wanted criminals and as a warehouse for weapons, and resolved to take action. In June 1984 Indian troops launched ‘Operation Blue Star’. They attacked the Golden Temple Complex, killing many of those inside, and seriously damaging the buildings. This invasion of the holiest place of the Sikhs infuriated many Sikhs, even the non-militant. They saw the Indian Prime Minister, Indira Gandhi, who had ordered the invasion, as a deliberate persecutor of the Sikh faith and community. In October 1984, Indira Gandhi was assassinated by two of her Sikh bodyguards. ~ Rajiv Gandhi, then Prime Minister of India November 19th 1984, at a Boat Club rally commemorating his late mother‘s birthday trivialised the murder of 2700 sikhs in Delhi. It is widely known that the October 1984 assassination of Prime Minster Indira Gandhi came at the hands of her own Sikh bodyguards. Less well known is that Gandhi’s assassination sparked four days of ethnic cleansing in northern India, with Sikhs and their turbans and long hair making them easy targets for retaliation. That my family survived the retaliatory massacre of Sikhs is the likely the only reason I am aware they took place. Amnesty International calls the episode, “A national disgrace,” referring to the Indian Police who orchestrated much of the killings and federal authorities who did nothing to stop them. At least 3,000 were massacred in Delhi alone, with countless of thousands more injured and raped. 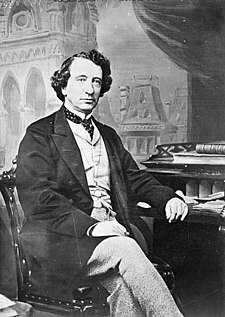 The assassination of the Prime Minister came admist alleged human rights abuses and violence between separatist Sikh movements and the Indian Army. In June of that year, “Operation Bluestar”, was launched on Sikh’s most important religious site the Golden Temple. Thousands, including many civilians were slaughtered. A news blackout as U.S congressman asked if what the Indian Govt. did could be justified? Classified Indian Leaders as terrorists but did not arrest or them. E. Why did they never answer him back for all the questions he ever had in his speech? F.If he was a terrorist why didn’t they shot him when they probably should have done at many occasion, and whydid they picked golden temple? 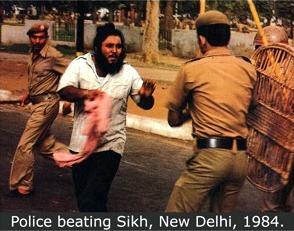 Was it really to arrest him and kill him or attack the Sikh faith and kill thousand of innocent Sikhs? H. Indian Govt. Blamed Sant Ji. for a lot of innocent killing of the hindus, Sant Ji. answered back to it saying I am Guru’s Sikh and I don’t fear death nor my sikh if we will do something we will claim it and we will do it in open and not hidding our faces. Then why did Indian Government callasified them as a terrorist but never Investigated any killings till this day(25 years later), they had hindu’s believe that Sikhs were killing them. Not only those sikhs faught against Indian Army, but they never left Shri Guru Granth Sahib Ji, when they have done it to save their lives like most Sikh Politician (Badal. Tohra and etc. etc(help me with getting more names please)) did after they promised not to. Those Sikhs were the martyred and the whole world should understand their is a differnce between these Sikhs and today’s terrorist. And if Indian govt. and those people want to call them terrorist then they should answer all the questions Sikhs have for them. On behalf of Amnesty International USA, I urge you to candidly address human rights concerns in India during your upcoming meeting with the Prime Minister of India Manmohan Singh and to press him to make substantive improvements. Prime Minister Singh will be the first leader to receive a state visit at the White House after you became the President. While you are honoring him with this state visit, Amnesty International urges you not to forget the plight of women, men and children who are facing numerous human rights abuses in India and to make public statements emphasizing that human rights are central to US-India relations. Your meeting with Prime Minister Singh in the White House represents an opportunity for you to directly communicate your concerns about human rights in India. While you discuss economic cooperation and civilian nuclear partnership with the Indian Prime Minister, it is vital that you also raise human rights concerns affecting millions of Indian citizens. Amnesty International strongly urges you to include human rights concerns in India in your joint communiqué with the Indian Prime minister Manmohan Singh and to address human rights concerns during your joint press conference with Prime Minister Singh. 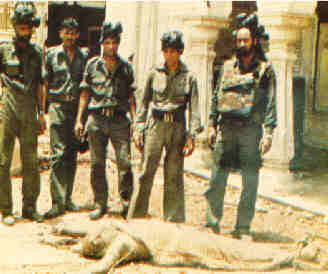 Some of the specific contexts in which mass abuses were or continue to be committed include: Mass killing of Sikhs: Over three thousand Sikhs were massacred when the governing Congress Party incited mob violence targeting Sikh civilians in reaction to the 1984 assassination of Prime Minister Indira Gandhi by her Sikh bodyguards. Scores of women were gang raped and some were burnt alive. After two decades, a judicial commission concluded that members of the governing Congress Party were involved. Twenty five years have passed since the massacre, but only a few have been brought to justice for this mass killing. Mr. President, Amnesty International urges you to secure a meaningful commitment from Prime Minister Manmohan Singh to improve India’s human rights situation. It is essential that human rights be treated as an important issue like trade and civilian nuclear partnership. Justice: Bring to justice those involved in the mass killings of Sikhs. While extolling the various aspects of Sikhs, he has said that Sikhs not only fill the hunger of India but they keep a watch over India. They have also played a major role in securing India’s freedom. According to him, if India comes solely under the authority of the Sikhs, then the problems of degeneration and poverty will be solved. The fear of any foreign invasion will cease to exist. Revered Tibetans Buddhist monk Dalai Lama, a Nobel prize winner, while paying his tribute to Guru Nanak Dev Ji said “Among the astral world of great religious and spiritual pioneers, Guru Nanak Dev Ji one of the most luminous stars on account of his unparalleled doctrine of life”. Tibetans Buddhist regard Guru Nanak Dev Ji as their savior, benefactor and worship as their deity. They behold him as the reincarnation of their guru Padam Sambhava. They have even constructed many temples in the memory of Guru Nanak Dev Ji. Tibetan Buddhists are divided into two sects, one of the whom do not trim their hair in Guru Nanak Dev Ji’s obeisance and adore him as Nanak Lama. These Keshdhari lamas when come to Amritsar, enter the holy Harmandir Sahib prostrating all the way to the temple (or Shrine). They have in depth study of sikh religious scriptures and say “God sent Guru Nanak Dev ji to bestow divine Light of Peace in the World. Through his holy songs, He guided the masses to attain eternal peace by living in “Divine-Will”. “Each Hindu family should convert at least one child into Singh, who can take care of this world which is our family.” Pandit Ji was strong devotee of Sant Attar Singh. He was himself inspired by him and encouraged others too take inspiration from Attar Singh. He also made him to lay down a foundation stone for Banaras Hindu University. – My Fathers Time: With at attack on the Golden Temple & Genocide and persecution of Sikhs. -My Time…. To Be Determined. This is where I call home, beautiful Vancouver British Columbia. It’s a great place to live work and play. I’m greatful to live in place so naturally beautiful and so rich in diversity of cultures. Vancouver is an amazing place but it has its dirty little secrets. I’ve spent several years of my live working as a community economic development practitioner working towards the revitalization without displacement of downtown east side(DTES) residents and small businesses. 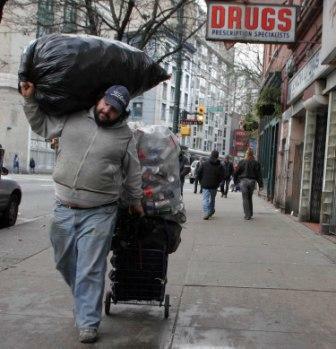 The DTES is Canada’s poorest postal code with an estimated 2000 homeless people in a few city square blocks. Its known as one of the most drug riddled areas in the world. 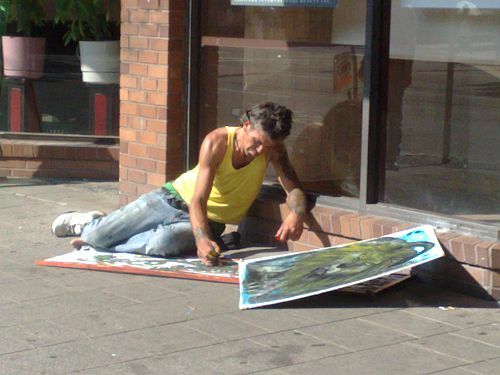 The Downtown East side also has the most artists in north america per square foot. 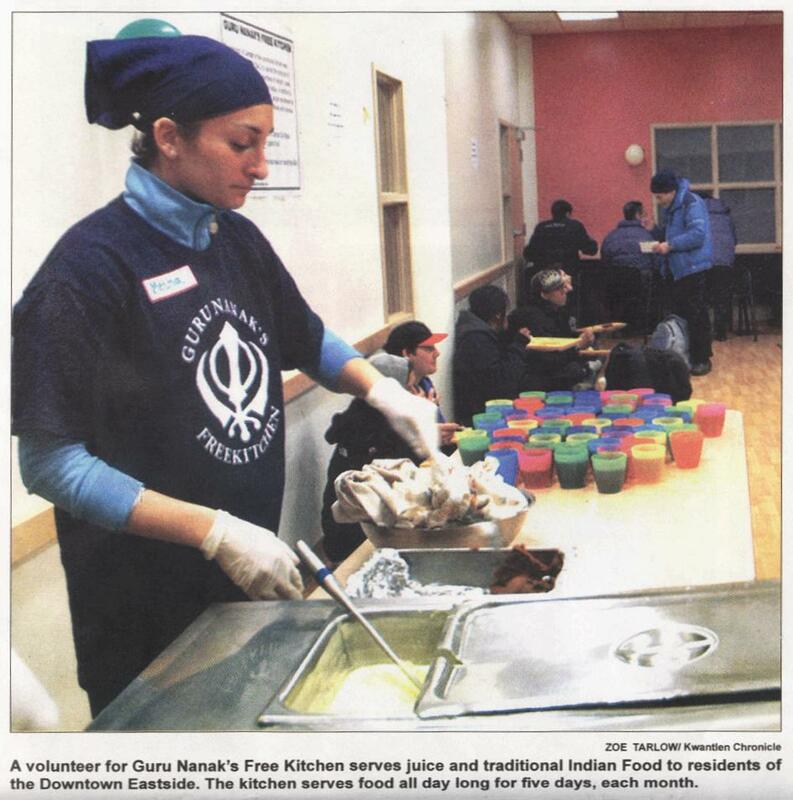 I’ve never volunteered or even connected with the individuals who run the Guru Nanak Free Kitchen in the Downtown East side but I admire the work they and there volunteers do. With the similar goal I’ve chosen to work along side them anonymously on the policy level. I’m a small business guy, although you won’t find any promotion of any of my ventures on my blog. I think I have a unique background and perspective on social, economical and political issues.